This program is for girls and genderqueer youth ages 8 and up with a thirst for magic and adventure! We'll be wading through swamps, telling stories, making songs, building, learning, tracking, and developing skills in survival and arts. We'll wander the woods, harvesting songs, stories, and magic! 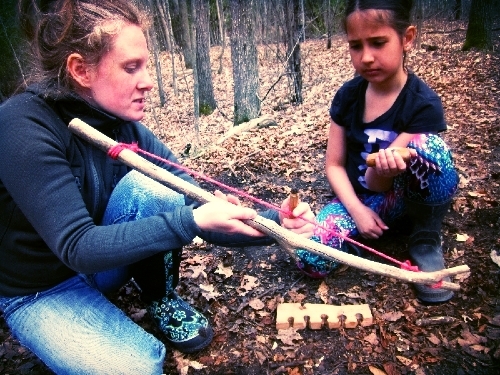 We'll deepen our ecological literacy and sense of home in nature through natural history and wilderness skills. We strive to provide a supportive and welcoming atmosphere to explore the wild landscape of friendship, community, and creativity. This is a program for no-holds-barred adventure, imagination, wild laughter, joyful learning, and getting truly filthy. Be warned: your car seats will need to be tarp covered. DATES: To be announced in Spring! If there is a young person in your life who is over 14 and would like to be involved, we would love to discuss some mentoring and leadership opportunities. Please email info@jumpingmouseprograms.org for more information.